A few weeks ago, I attended and enjoyed your one-act monologue play Banijye Basate Lakhhi, a script about Bengali absence, by and large from the world of business and commerce. It may not have had much dramatic impact on audience because of its format and contents- probably it was not intended to; but enlivened by your natural and easy acting, was interesting indeed and set the Bengali viewers on to soul searching. In that aspect it was quite effective. The subject of your play is topical and in that respect my comments although late in coming, may not have timed out or turned stale. You touched on the maladies that inflict us, discouraging us from launching a venture, aversion to risk taking, reluctance to work hard, and absence of desire to set our spirit free. All these are so very true and have triggered some thoughts in my mind. No matter what we do in our professional lives, the primary objective of most of us is to earn a living; assuring us that there will be an adequate remuneration guaranteeing a survival in whatever we pursue. Bengalis are not sure that a business plan meets that need, because such images are few in our homes or in our surroundings; in other words examples and role models are rare, if any. I think this mind set has a relatively recent historical background to it. The British settled in Calcutta and its vicinity and ran their administration, and trade and commerce from there. . They needed an army of bureaucrats as much as they needed a military one to rule. They found a fertile ground in Bengal and in Bengali psyche. They created schools and universities to train the cadre. The Bengalis, mostly the Hindu Bengalis joined in force. For us, the British were more civil and better masters than the Muslim rulers of that time and that working for them was an easier way to make a living than the other options available. Our rulers created a whole army of clerks and middle order supervisors. 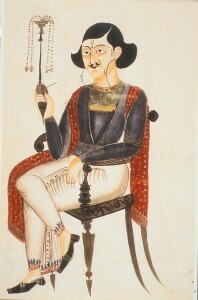 The Bengali middle class joined the force in droves and spread over other parts of India, particularly the neighboring states and northern part of the country. And that created a vacuum in Bengal in manufacturing and trading sector and opened up the domain to people from other states, Rajasthan, for example. The new entrepreneurs from outside the state also found a mighty pen wielding work force ready to serve a new batch of masters. In addition, from among those who served them subserviently and faithfully the British created a new class of mini-lords to do their dirty work of keeping the masses on leash. They gave this selected group the ownership of land, power to collect revenues and also titles and salutations to go with it. Zemindary system was already in existance from Mogul times; the British finessed it and created a class of aristocracy dependent on them. Actually they were the moneyed group of potential investors. But these affluent landowners chose not to invest in mundane enterprises like cotton mills, jute mills or steel mills; those tasks were left to people from Rajasthan, instead they spent it on building palaces, trips to Europe, jewelries as well as patronage of arts and culture. Bengali entrepreneurship never took off the ground. In your play you spoke about the risk element of business. In order to take a risk one has to have faith that things are more likely to come out favorably than not. With faith, comes religiosity, a belief in supernatural power. By no account the Bengalis can be accused of abundance of religious faith. In our heart we do not really believe with certainty that someone is there to save us from the pitfall and that entity will do your bidding in exchange of five varieties of fruits offering; therefore we are reluctant to take a chance. We Bengalis probably do not believe that a huge edifice like a Birla temple at Gariahat Road can wash away our perceived sins acquired from the contemporary business practices of mixing stone chips with rice or cheating on taxes or killing babies by marketing spurious drugs, That is no way to hint that the Bengalis are overly ethical or conscientious; just that they are not sure of the fall back positions or an exit strategy in case anything goes wrong. Your narrative makes sense, just look around us. This country we now live in has the most favorable environment in the world for free enterprise and it is really many fold times easier to start and succeed in a business here compared to other places. Our compatriots from other regions of India have taken advantage of this much more than we Bengalis have. Sadly we have carried our bugs of business-averse genes to a new world where environment is favorable for us to have shaken off our old propensity and started anew. Talking of propensity; is Bengali mind too analytical? Is the Bengali institution of “Adda” which is endless analysis, discourse and inconclusive argument about nothing is a manifestation of our risk-averse nature, of not being able to make a decision and then avoid an action? Another aspect of this conundrum is perhaps our obsessive love of culture; a softer side of human mind, which makes us dreamers and the dreams have no consequences, no risk attached. Am I blaming over-feeding on culture, spending too much of our time in poetries, songs, dances and dramas and our self-professed intellectual bend of mind for our reluctance to come down from the cloud nine and face the real harsh world? I will be less than honest if I say that this thought does not cross my mind. Keep on doing good work, Sudipta.